We are proud to introduce our newest team member and accomplished Sales Associate, Leah Cox. 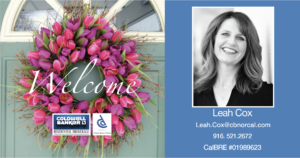 Leah moved into real estate in an effort to combine her desire to help people achieve their goal of homeownership with her personal desire to see her community flourish. She quickly became a source to turn to for current market trends and information in her community and beyond, and as a result, she was named “Rookie of the Year” in 2016. Leah credits her immediate and ongoing success to her long hours, positive outlook, and most importantly, putting her client’s interests first. Leah’s strong negotiation skills, dedication, and friendly nature make her an excellent choice for a Realtor®. We look forward to being a part of her many successes ahead and are thrilled that she has joined the team! "From the very first call, Craig was polite, professional, personable and knowledgeable. We recommend him highly to anyone with real estate needs!" Sign Up! New listings delivered to your inbox!